The Michaelsberg is in the focus of the world heritage city Bamberg in 2015. On the occasion of the millennial anniversary of St. Michael Abbey numerous celebrations and cultural events will take place. Thomas Michel has delved into the Heaven’s Garden of the church by creating a virtual installation. The complex at the Michaelsberg was founded in 1015 as Benedictine Abbey by the first Bishop of Bamberg Eberhard I (1007-1040) together with Emperor Henry II (1014-1024 Roman-German Emperor). The abbey was consecrated to archangel Michael, in order to put the city under the protection of the Heavenly Hosts. As prince of the angels and bearer of the flame sword Michael defends God and the Creation against the Evil and throws Lucifer down into hell. Due to its position north of Bamberg the mountain, the Benedictine Abbey was built on, was predestined to be consecrated to archangel Michael with his Heavenly Hosts, as according to faith, the evil came from the north. Since then the Michaelsberg with its abbey as one of the seven hills of Bamberg dominates the cityscape and is also part of the UNESCO World Heritage Site “Historic City of Bamberg”. The widespread monastery complex around the Michaelsberg comprises a 420 hectares large coherent core area and reaches far beyond the actual monastery grounds with their baroque terrace gardens. Orchard meadows, allotments, and the neighbouring Michaelsberg forest show the historically grown structures still today, and are in their original state of preservation unique in the history of German monasteries. Also the Ottobrunnen and the Provost’s Church St. Getreu belong to the monastery ensemble Michaelsberg. Besides the cultivation of fruit and wine-growing, livestock and fish breeding were practised to improve the living conditions of the population. But St. Michael also had a Christian educational mission, by distributing scriptures, the sponsoring of art and architecture, Christianity was sought to be strengthened. In the course of this mission the foundation of other monasteries followed the abbey on the Michaelsberg in the district of the Diocese Bamberg over the centuries. After extensive repair measures and the new construction of the nave and the steeples, the sanctification of the church took place again in 1617. The vault of the nave was painted with a herbarium of 578 different plant species, under the name “Heaven’s Garden” the ceiling fresco is world-famous. The work was created between 1614 and 1617 under Abbot Johannes V Molitor by an unknown artist. The monumental ceiling painting stretches across the nave, the side aisles, and the transept. The Heaven’s Garden at the Michaelsberg contains the entire knowledge of its time about the then known flora, and is a document of the importance of botany as emerging science of the 16th century at the same time. The library of the abbey at the Michaelsberg also included the work “Plantarum seu Stirpium icones” by Matthias de L’Obel published in Amsterdam in 1581. The lifelike illustrations on the arch show trees, herbs, flowers, moss, and grass. 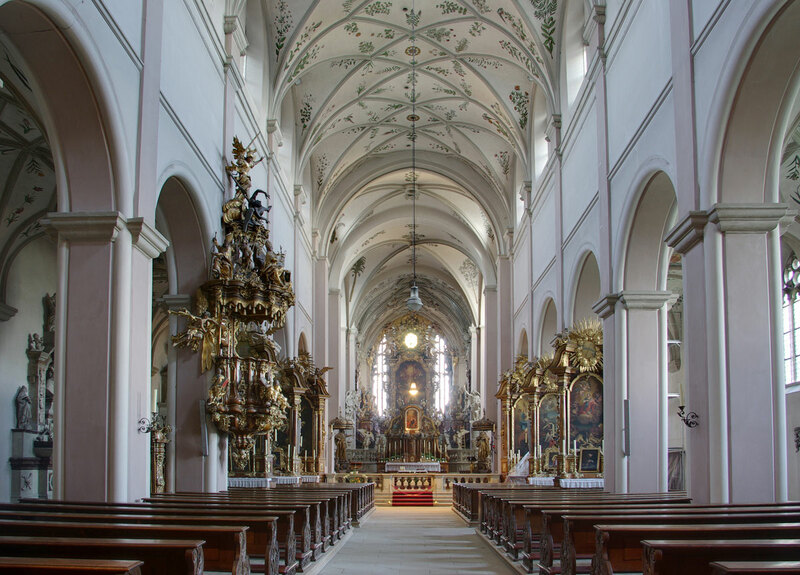 About 1696 the Baroque transformation of the Romanesque church was started under Abbot Christoph Ernst von Guttenberg (1690-1725), with fatal late effects, which have become visible not before now. Leonhard Dientzenhofer designed the Baroque exterior façade, Johann Dientzenhofer the terrace. The superimposed Baroque façade has a similar effect on the building as a backpack, tearing the nave apart. As a result both steeples are tilting millimetre by millimetre in a westward direction, whereas the exterior walls are spreading in a northern and southern direction. The pier basilica with the famous “Heaven’s Garden” shows heavy cracks and is in danger of imminent collapse. The basic safeguarding has been completed in the meantime, but for an indefinite period of time the church on the Michaelsberg won’t be accessible for the public. The virtual light installation “Herbarium Bambergensis” by Thomas Michel dignifies the Heaven’s Garden of the Michaelsberg Abbey as an outstanding and inspiring work of art also for contemporary artists. Pictures emerged by the technique of Hydrography with their biomorphic forms of appearance are projected with crossfade technology, creating a cosmos that reveals the growth principles of nature.